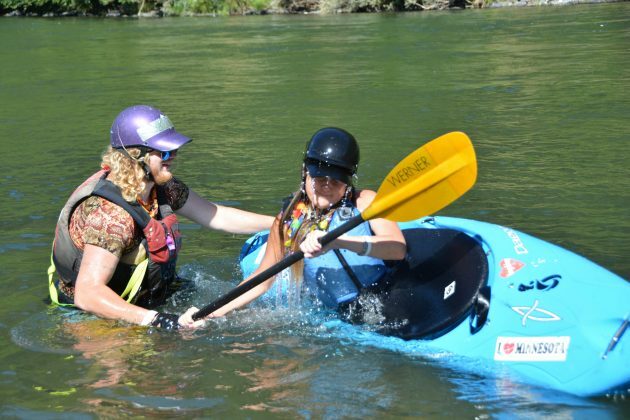 As a beginner kayaker, being upside-down can seem scary, but as you’re learning how to kayak, you’ll find that it’s just part of the sport. 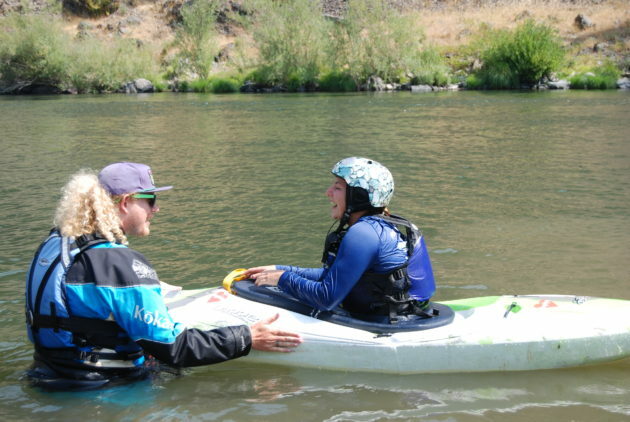 Here are five ways to manage the fear of flipping over, relax your body and mind, and make you a better kayaker. 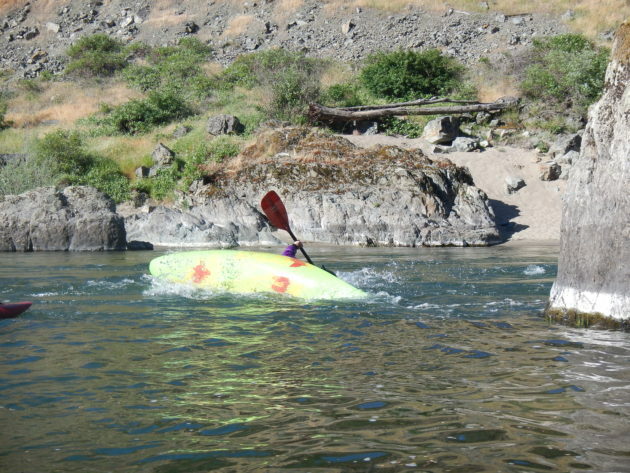 Try this drill as a warm-up: once you’re geared up, wade into the eddy. Close your eyes. Slowly sink your body neck deep into the water and relax. Maybe kick your feet up and float on your back. Now, stand up, take a big, deep breath, and exhale all the air from your lungs. Sink down to your neck. Take another deep breath, and float face down as long as you can. If you find yourself panicking, repeat the drill a few times until you begin to feel more comfortable. Does 30 seconds on the microwave seem longer when you’re staring at it, or when you do something else while waiting for the beep? If you’re like most people, that time flies by when you have a distraction. When you’re underwater in your kayak, you can apply this same principle. Instead of counting the seconds that you’re down, sing a song to yourself. When you’re focusing on the song in your head, your hangtime will be much longer than if you’re counting the seconds. Positive visualisation is an incredible mental tool that you can add to your toolkit. When you’re at the office or at home daydreaming about the river, take a moment to mentally picture yourself being turned upside down by a wave. If you find yourself remembering that panicked sensation from the last time you capsized, mentally replace that feeling with the sensation of calm. Think of yourself finding your Zen as you float underwater, picture what it feels like as you move through current upside-down. Visualize yourself remaining calm as you wait for an assisted rescue. Finally, continue to keep that calm feeling when you pull your skirt and swim. If you mentally picture it beforehand, your brain will remember that you have been there before and will reduce the panic response. + Pro tip: Use this same technique when scouting a rapid to visualize a successful run. Ask your instructor to spot you while you practice your hangtime. Flip yourself over in a calm spot and simply focus on relaxing your mind. Use that mental distraction and hang out underwater as long as you can. When you’re ready, tap the sides of your boat and your instructor will roll you right back up. + For an extra challenge, do this same drill in moving current. And don’t forget to tuck! Being underwater gets WAY less scary when you know how to get yourself back up on your own time, instead of waiting for a T-Rescue or having to swim. Once you’re ready, schedule a roll session with an instructor and start working on this essential skill. This isn’t one you can learn overnight, but be patient and keep practicing! 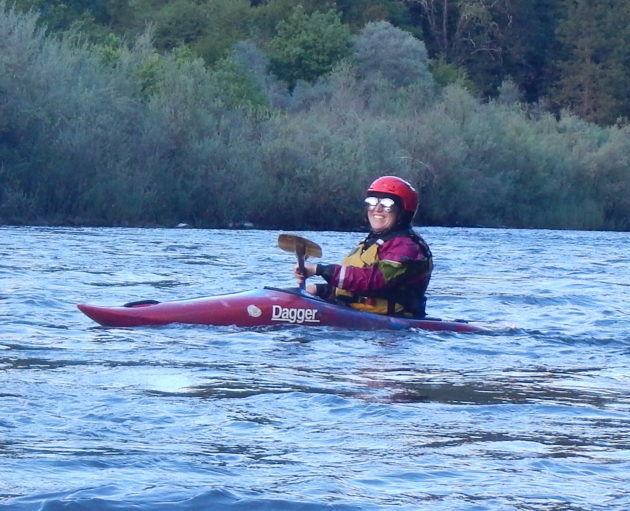 Sharon "Buckets" Saltoon is a first-year raft guide and kayak instructor on the Wild & Scenic Rogue River. When she's not on the water, you can find her lounging in a hammock, sipping on kombucha, and eating way too many nutter butters.